Welcome to the View from Above! A series where we take you on a Journey to some of the most beautiful places on earth! Journey with us over the valleys, beaches and terracotta-roofed houses of Italy. Italy is home to some of the worlds’ most historically beautiful landmarks. Whether wandering around the ancient temples and coliseums of Rome, or the cathedrals and palazzos of Tuscany and Venice, the visitor has something to marvel at. Riding gondolas, sharing a glass of Italian wine, sampling pizzas and gelato, gawking at old bell-towers or relaxing on beaches is part of the Italian tourist’s fair. 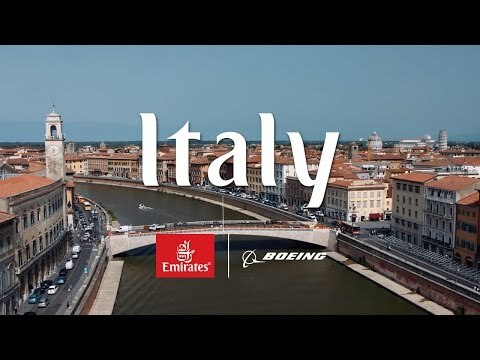 Take a look at Italy from the viewpoint of a DJI unmanned camera drone, delivering some of the most stunning footage of a beautiful country. Italy is as old as history itself. The long-stablished home of western civilisation, Italy was once territory to various Etruscan and Grecian villages. A particular branch of Etruscans around the region of modern day Rome grew in prominence, both militarily and economically, and formed the Roman Republic. The Republic, later becoming the Roman Empire, still remains one of the greatest civilisations to have graced the planet. After the fall of the Roman Empire, largely as a result of Rome’s overexpansion, a number of barbarian tribes moved into Italy generating a patchwork of little states. These states were, throughout the Middle Ages and the Renaissance, constantly in a state of inconsistent flux. The Renaissance marked great developments in art, science and religion, and also signalled much foreign political involvement from both the French and the Spanish. Only by the 19th century was Italy capable of evolving into a single state, and after the two horrific wars of the 20th century it was able to become the European power that it is considered today. Visiting Italy means, quite simply, visiting Rome too. There are too many landmarks and places of interest to mention. The Colosseum, the Pantheon, the Piazza Navona, the Roman Forum, Vatican City, Basilica Santa Maria Maggiore, and the list goes on. But when in Rome, do like the Romans and head to Campo de’ Fiori for a fun night on the town, or look for a small quiet Italian bistro in which to share a pizza. Head to the Piazza de Spagna for some retail-therapy in Italy’s famous designer stores, or ride a bike through Rome’s historic streets. In Rome you will never find boredom. But Rome isn’t always the hottest location in Italy, because Venice often shows its colours. One of Europe’s most romantic cities, Venice is a maze of small alleys and canals on which every visitor will float on gondolas or relax in historical piazzas. No visit is complete without visiting the Doge’s Palace and Saint Mark’s Basilica. With some spare time on hand visit the Venice Jazz Club or the famous Opera House, or just order some gelato and sit on the steps along the Grand Canal. No trip to Italy is complete without visiting the iconic Tuscan region. From the little villages, to the vineyards and country cellars, an authentic Italian experience is available for everyone. Florence is a city packed with renaissance history, while the city of Pisa is the place you want to go to visit… you guessed it, the Leaning Tower of Pisa. Siena is probably the quintessential Tuscan hilltop village (in this case it is now considered a city), and everyone should experience wondering around its streets. Italy is as beautiful as it is old, and often it is deemed beautiful because it is so old. Whether relaxing in a piazza, visiting a cathedral or shopping on cobbled streets, Italy is a historic wonder. Witnessing this amazing location from an interesting perspective with View from Above allows the viewer to truly respect Italy as one of the flowers of Europe.